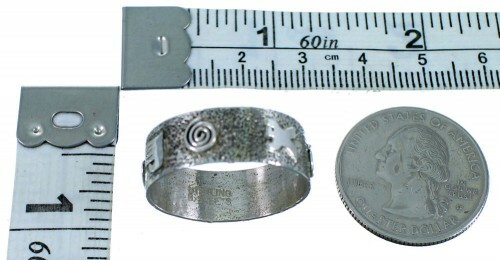 Ring is size 9-1/2, it measures approximately 1/4" long and 3/4" at widest point. This amazing ring is a work of art and has everything you could possibly want from a piece of Native American jewelry! 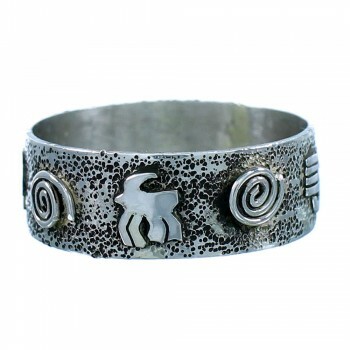 This piece of Native American jewelry is Navajo overlay hand crafted by artist S. Skeets, out of genuine sterling silver. 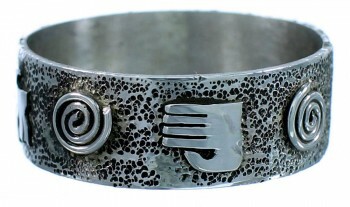 Overlay is a process that utilizes at least two layers of sterling silver. One layer forms the foundation, while the second is used to design the individual detailed overlay. 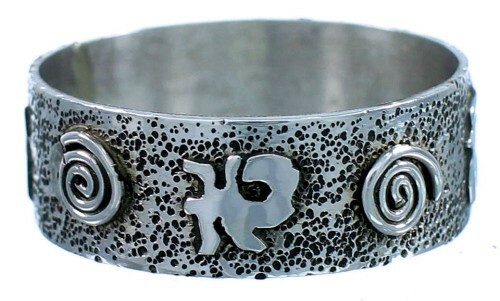 In this ring, the second layer forms a hand, lizard, water wave, and other Native American designs. In Native American beliefs, water waves design represent continuous life. 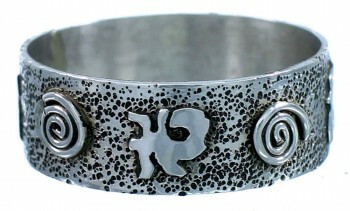 The belt buckle is stamped sterling and hallmarked by the artist. The hand represents the presence of man. It signifies his work, his achievements, and his legacy. It also depicts direction of the creative spirit through a man. It is known as a vessel for the Creator's power. Ring is stamped sterling and hallmarked by the artist.